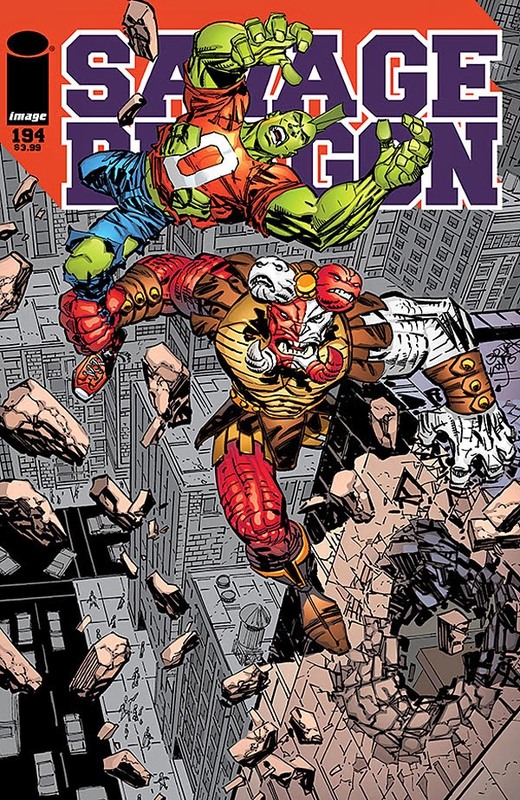 It's A Dan's World: PREVIEW OF THE WEEK: SAVAGE DRAGON #194 "Mom's Dead. This Big Demon Came Up Out Of The Ground And Squished Her." PREVIEW OF THE WEEK: SAVAGE DRAGON #194 "Mom's Dead. This Big Demon Came Up Out Of The Ground And Squished Her." WHY YOU SHOULD CARE IN 70 WORDS What, Super Patriot isn't enough? How about the fact Erik Larsen is still writing, drawing and inking the same character, in the same un-needlessly relaunched series he was when he helped launch Image Comics? He's like a one-man Rolling Stones! 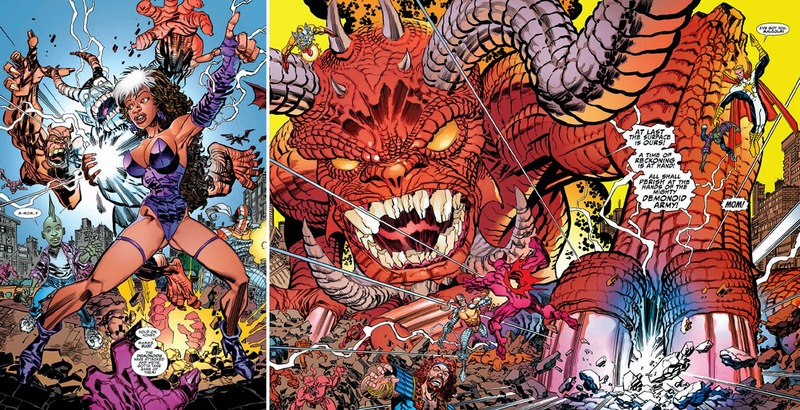 Throw in a passing of the torch between Dragon and son, and a tonne or two of Larson meets Kirby art and we're sorted. Oh yeah, and a BIIGGG demon. I... have some catching up to do. Although this was/is one of my favorite series of all time, I have not had a chance to buy an issue since about #169. Maybe #151... I'd have to check. Larsen IS the man, though... I'm pretty sure he wants to beat Dave Sim on Cerebus for most consecutive issues. I was wondering if he had a particular run in mind too King! Then I wonder what happens. His style may be a bit darker, but I'd love to see the original (plus backdated) founders do a run on each others books. McFarlane on The Darkness, Silvestri on Savage Dragon, Liefeld on Shadowhawk, Kirkman on Spawn, etc That would be pretty cool! Well, they did that one thing back in the day where they traded duties on a single issue once... And Larsen went back and re-did his issue, because he wants that consecutive-record, man! I just downloaded all the issues I'm behind on, up until about 5 issues before this one- I got some reading to do!